Take superb shots on the go with the slender and stylish COOLPIX A300. It’s small and light enough to slip in a pocket or bag, so you’re always ready to shoot close-ups of friends and family with its 8x optical/16x Dynamic Fine Zoom. You'll take share-worthy high resolution photos that you can share with family and friends using Nikon SnapBridge. 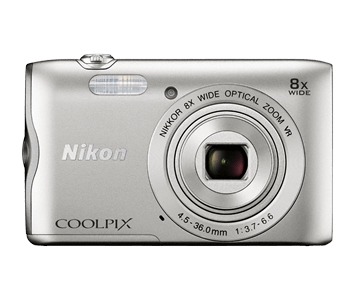 The 20.1 megapixel CCD image sensor guarantees high-resolution images, while high-performance Vibration Reduction (VR) reduces camera shake, ensuring you only take sharp shots or smooth HD movies. Use Smart Portrait System as you shoot for perfect portraits, and Scene Auto Selector to automatically optimize camera settings. Install Nikon's SnapBridge app on a compatible smartphone or tablet* and unlock exciting new capabilities with the COOLPIX A300. Built-in Wi-Fi®, NFC and Bluetooth® low energy (BLE) maintain a connection between the app and your camera, so each shot you take automatically transfers to your smartphone or tablet for sharing, editing with photo apps or uploading to your favorite sites. You can even use the SnapBridge app to control your camera remotely! Get lots of “likes” by shooting in Smart Portrait System which lets you make your friends look even better than before or create a special mood in-camera before shooting, and even automatically take a picture when the subject smiles. Plus you’ll have 12 Glamour retouch effects to apply to already-shot images as well. If expansive scenery is your thing, use Panorama assist to stitch multiple shots together into a single panorama. *Based on Camera and Imaging Products Association (CIPA) standards for measuring the life of camera batteries. Measured at 23(-/+2)°C (73(-/+4)°F); zoom adjusted with each shot, flash fired with every other shot, image quality set to Normal, image size set to 5152 x 3864 (20.1MP). Battery life may vary depending on shooting interval and length of time menus and images are displayed. All measurements are performed in conformity with Camera and Imaging Products Association (CIPA) standards or guidelines. Battery life does not reflect the use of SnapBridge and may vary with the conditions of use, including temperature, the interval between shots, and the length of time that menus and images are displayed. Individual movie files cannot exceed 2 GB in size or 29 minutes in length. Recording may end before this limit is reached if camera temperature becomes elevated.